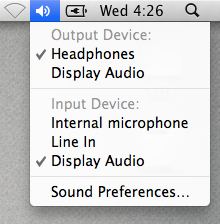 Now that I have beautiful Apple Cinema Display, I have the option to use either the included speakers or my headphones. The Mac OS X 10.6 Help page on the topic explains how you can do this from the System Preferences, which isn’t the quickest way. You simply hold alt and click the speaker icon on the status bar. Then, you can choose which output source u want.